What is LASIK? What is the success rate? What is involved? LASIK stands for Laser In Situ Keratomileusis. Kerato means the cornea, and smileusis is Greek for carving or sculpting. It is called in situ because surgeons work with the cornea while it is in the eye. This is a procedure designed to correct the refractive error of patients who are short sighted, long sighted or astigmatic. It involves the creation of a very thin layer (or flap) of the cornea, which is lifted under local anaesthetic. 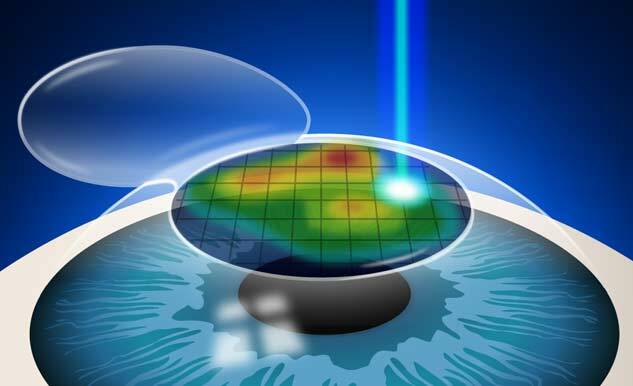 The laser is then applied, re-shaping the underlying surface for the correction of the refractive error. The flap is then replaced like a natural band-aid and bonds rapidly with the cornea without requiring any stitches. What steps do I need to take to have LASIK? 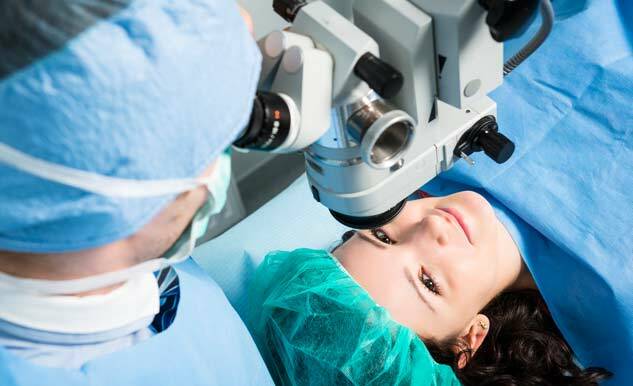 How do I know if I am a good candidate for LASIK Eye Surgery? A large percentage of nearsighted, farsighted, and astigmatic patients are potential candidates for LASIK. Patients who are 18 years of age or older, have healthy eyes that are free from retinal problems, corneal scars, and any eye disease are suitable. Along with being medically suitable, the best candidates are people with a lifestyle or occupation in which they are dissatisfied with their contact lenses or glasses. By having an evaluation, examination, and consultation with you, the doctor will be able to determine if you are a good lasik candidate. In our practices, LASIK is performed as an office procedure in the comfort and convenience of an excimer laser eye surgery suite. The entire treatment takes about 5 to 7 minutes per eye or approximately 15 minutes for both eyes. You could expect to be at the clinic for about 1-1,5 hours on the day. We ask that you have a restful day after your procedure, and recommend that you sleep or rest with the eyes closed to assist the healing process. What happens if my eye moves during surgery? The Excimer laser is fitted with an infrared eye-tracker which is locked on in position prior to the commencement of laser application. This eye-tracker measures eye movements during surgery and is capable of following and adjusting the laser application as small movements are detected. If the eye moves outside of the eye-trackers range it will halt the process automatically. This provides excellent safety and surgeon control. What Kind of Anesthesia is Used During the Treatment? Numbing eye drops are used. Sometimes an oral medication is used to help with relaxation. Don’t worry -no needles or intravenous drugs are used. Can I See the LASIK Treatment as it is Being Performed? You will be “awake” but very relaxed. You will not be able to see any of the details of the LASIK treatment. You will see a number of lights, but the images will be blurred. Will I Experience Pain after The LASIK Treatment? Some patients experience a feeling of burning or scratchiness. This feeling generally lasts from one to three hours following the treatment. Most people feel fine if they can take a nap soon after the treatment. Should I have a Custom LASIK Eye Surgery Treatment or a Conventional Treatment? The best treatment for you depends on the measurements we take from the Aberrometer and your other clinical measurements and vision complaints. This will indicate the presence and severity of aberrations, or distortions, which will necessitate a Custom Laser Eye Surgery treatment. You may have specific complaints that are related to the optical aberrations that are not corrected by your current glasses or contact lenses. Finally, Custom Laser Eye Surgery is usually indicated for anyone who has had previous corneal surgery. Why should I have Custom LASIK Eye Surgery when conventional Lasik Eye Surgery worked fine for most of the people? 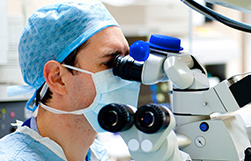 Conventional Lasik Eye Surgery has provided excellent results for literally millions of people. However, if you are a patient who has unusual aberrations not readily corrected by conventional Lasik Eye Surgery, customized laser eye surgery is the best choice for you. The best thing to do is to come in for a Complimentary Consultation and together, the LASIK surgeon and you, can determine which treatment option is necessary and best suited for your individual needs. Can family and friends accompany me on the day? Yes, they are more than welcome. You will need a driver for the day of your surgery. Can I drive after my procedure? When Can I Go Back To Work? You can not drive until you have been seen by the surgeon the day after your procedure. After that, you may drive when you feel confident that your visual acuity and eye comfort allow you to drive safely .Returning to work depends on the type of work that you do. Most patients are back to work full-time the day after treatment. The recovery time is rapid, but reading the computer screen (or reading in general) may be difficult for the first week while the tissue is healing. How Soon After The Treatment Can I Bathe or Take a Shower? Your LASIK Surgeon will advise you as to the specific, however typically you can bathe the same day as the treatment but you should not shower for 2 days after the treatment. As always, avoid getting soap or water directly into your eyes. Avoid rubbing your eyes during the first month after surgery. How Soon Can I Use Eye Makeup? You may resume wearing eye makeup starting 1-2 weeks after your treatment. We strongly recommend that you purchase new eye makeup, specifically mascara, to avoid potential infection following your treatment. How Soon After The Treatment Can I Exercise? Non-contact sports can be resumed as soon as you feel capable. Eye protection is always recommended for racquet sports or rough sports where there is a risk of being hit in the eye. You should stay out of swimming pools for one week after your treatment, and rivers, lakes and oceans for two weeks following your treatment. What is Intralase™ laser eye surgery? 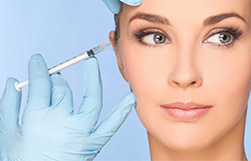 Intralase™ is a procedure that involves 2 lasers to perform a LASIK treatment. A Femtosecond laser is used to ‘cut’ the flap which can take up to 2 minutes to complete. The patient is then moved to a second laser where the corrective treatment is undertaken in the normal way. What is the real difference between conventional Laser Eye Surgery and Custom LASIK Eye Surgery? Conventional Laser Eye Surgery treats the vast majority of common optical aberrations called “lower order” aberrations. These are responsible for causing nearsightedness, farsightedness and astigmatism. Custom LASIK Eye Surgery provides a more precise treatment for patients who have “higher order” aberrations, which we can now measure with the Aberrometer. For these patients, customized laser eye surgery may provide a better quality of vision by measuring and addressing all of these aberrations as part of the treatment plan. How Soon After Surgery Will I See Well? Each patient is different. Visual rehabilitation after treatment is rapid. You will be able to see your surroundings immediately following surgery The eye drop medications cause some blurring, but most patients notice a dramatic improvement even as they leave the office. More than 4 out of 5 patients can pass a driving test without glasses or contact lenses after the treatment. Within 4-6 hours after surgery your vision becomes quite clear. Most people achieve good vision the day after surgery and find that their eyes feel fairly normal 24 hours later. However, your sight will improve even further, and the very best vision could take two to three weeks. Will My Eyes be Patched?? What is the percentage of patients receiving Uncorrected Visual Acuity of 20/20 or better? This depends on the refractive error to be treated. 96% of individuals with Myopia or shortsightedness less than -10D, can achieve 10/10 vision following LASIK. 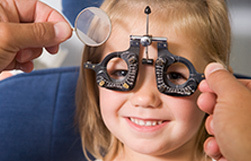 Nine out of ten of those with high levels of astigmatism (up to 6D) and myopia can also expect to achieve 20/20 vision. For those individuals with hyperopia or long-sightedness the results are similar, those with low to moderate levels of hyperopia up to 94% achieving 20/20 or better. The effects of laser treatment are permanent, but your eyes may change over time. That’s why we recommend having the procedure after major eye changes have occurred in your life. Will I Need Reading Glasses After the Treatment? Generally, patients under 40 years of age read well without glasses following the treatment. Patients over 40 may need magnification for reading fine print. Presbyopia is the term that refers to the natural weakening of the focusing muscles that occurs in our early to mid 40s, causing us to need the magnification that reading glasses provide. The LASIK treatment does not correct or prevent presbyopia. We also will be glad to discuss another option called monovision. Can LASIK work for all types of eye disorders? LASIK is the most common type of refractive laser surgery today and is used to correct only long-sightedness, short-sightedness or astigmatism. There are a number of advantages to using a mechanical microkeratomes over a laser created flap. With a mechanical microkeratome the LASIK treatment is one continuous process; there is no need to move the patient or the equipment to move from one laser machine to the next. 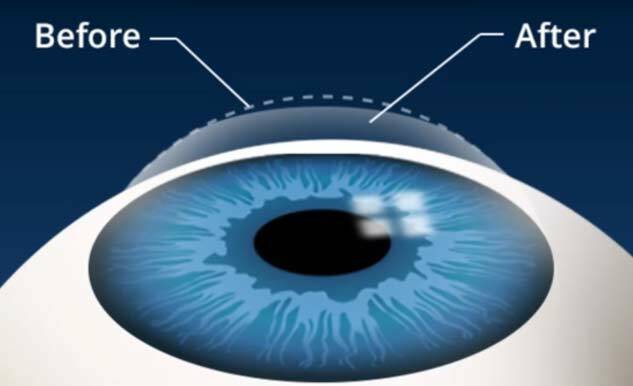 The mechanical microkeratome is also faster at producing the flap, so there is less drying of the eye, which can affect the accuracy of the laser procedure. 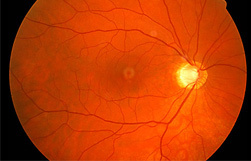 When using a mechanical microkeratome suction is engaged for only 5-10 seconds rather than the longer periods of up to 100 seconds or more required for laser treatment; less time under this suction further reduces the very small risk of a severe vascular event of the retina or optic nerve. When using a specialised mechanical microkeratome, there is no need to perform a manual dissection of the flap, which carries a risk of flap tears.